On the south west coast of Wales there is a wonderful 13th Century Norman Keep called Benton Castle. It is on a promontory overlooking the Haven, an inlet close to the place where the Bristol Channel meets the Irish Sea. Between the totally white castle and the river is an enormous stone Chartres-type labyrinth. It is sixty-four feet (19.5 meters) in diameter, and the walls are made of old discarded banged up kerbstones (they’re beautiful – more like rough megalithic stones). A wonderful and highly talented septuagenarian Elizabeth Sulivan the owner of Benton Castle dowsed the location of each kerbstone. I had gone to visit her with Patrick MacManaway, a Scottish geomancer who had studied with me in Vermont in the early nineties, and is also co-anchor of our website. I asked Elizabeth how she got the idea for this labyrinth that, with the help of two men, had taken her two years to build. Elizabeth also finds close connections between the chakras and labyrinths and healing. (I find this as well.) She goes on, “Having found the chakra full of diseases in the centre, I went full steam ahead wondering if I had tumbled into a technology, lost to this age, by which I could get the sight back in my eye. I have no medical training. My pendulum placed them (the stones) for me.” Every decision was based on her intuition as seen through her dowsing. Chartres type Labyrinth and Earth Energies as dowsed by the author at Benton Castle April 1996). Dome and veins are in grey. Energy Leys are in straight thick black lines. North is at the top of the picture. There are two stories of special interest concerning the construction and lay out of this new sacred space. The first has to do with primary water. Elizabeth Sulivan is a good water dowser. She has dowsed wells for her farm on the estate. She has used her divining skills to locate missing persons. She dowsed the location of every kerbstone that makes the walls of her labyrinth. When she began, she dowsed the sloping lawn that she intended to use. At that time, there were no domes of water (blind springs) under that portion of her lawn. She just dowsed the best place to locate it. Bill Cooper, a retired Major General in the British Army, is now the President of the British Society of Dowsers. He told me that one day he had been at Benton Castle for lunch (Elizabeth is an outstanding cook). and he found that there was a dome of water under her dining room table. He had dowsed the castle on previous visits, and there had been nodomes under the castle. They both found the new dome, and it appeared to be moving slowly towards the labyrinth! The goal of a labyrinth is in the middle/centre of the labyrinth. The term “middle’ and ‘centre” are not used because they can be confusing. Is the middle of the labyrinth half way in or at the end? Also, goals of labyrinths are not necessarily in the geometrical centre. When I arrived at Benton Castle, it was several weeks after Bill Cooper’s visit. I found the dome to be directly under the goal of Elizabeth’s labyrinth! This is not the first time this phenomenon has been observed. Marty Cain, a dowser and labyrinth builder in New England (USA) has been finding this for several years now. I am also hearing talk about this on the Internet. Labyrinths call in water? Apparently. Primary water comes up from the bowels of the Earth initially as steam. It moves its way under pressure towards the surface of the Earth in what is called a dome (or blind spring) until it hits an impermeable layer, at which point, it goes out laterally as veins of primary water through cracks in the wall of the dome. This pattern apparently can be repeated again and again, getting smaller and smaller, as the water moves towards the surface of the Earth. Energy leys are six to eight foot-wide beams of yang energy, which sometimes run concurrently with leys – alignments of holy sites. Energy leys cross over primary water at many sacred spaces. Energy leys come down to the surface of the Earth at power centres like the labyrinth at Benton Castle. These apparent beginnings of energy leys are called downshoots. The energy ley (E ley) then turns ninety degrees over the dome and follows the surface of the Earth in a dead straight line for some distance crossing other power centres along the way. It goes to earth at an earthing point where it turns another ninety degrees and goes down toward the centre of the Earth. The Earth energies, as I see them, were in place at the Benton Castle Labyrinth when I dowsed it with the dome under the goal, and the energy leys crossing at the goal as well. The dome under the goal of the Benton Castle Labyrinth had seven veins. The kerbstones that make the walls have small gaps in between them. Except for one kerbstone in the fourth quarter (the kerbstone “containing” the dome where that vein exits the dome), they all ran through the gaps between the stones, and when viewed from above, they all curved away from the dome gracefully to the left, or widdershins/counterclockwise!. One of the veins, as I find at all geomantically constructed sacred spaces, exits out the mouth. There were two through energy leys and two earthing points meeting over the dome in the goal of the labyrinth. As you can see from the drawing above the two B leys that go to earth there are almost opposite each other. At first I dowsed them as a single B ley, but when I was also shooting the azimuths of the E leys, I found, initially by looking at their direction of flow, that they were not one single B ley. In the past, I don’t believe I have found more than one earthing point at any given power centre. I have never seen two half energy leys (the two earthing points) before at one power centre. I hazard to speculate that these two earthing points/ends of E leys could be just a temporary phase as the Earth energies gather and adjust at this new sacred site. I suspect that this odd confluence of B leys will change, and become more stable. Every truly sacred site has a connection to the cosmos through astronomy. I took the magnetic azimuth of each energy ley as well as the angle of elevation to the horizon at those points. I wanted to check for possible astronomical alignments with the energy leys. Before I go any further, I need to talk about archaeoastronomy and the issue of accuracy. Modem science has allowed us to become accurate within millimicrons. No, down to minute bits of atoms. I do not believe it is necessary in the construction of sacred spaces to be that accurate. Aside from the US Government, many divinatory methods have a “fudge factor.’ In astrology is it called the “orb.” In gematria it is called a “Cole”. Numerology has the same concept. Close enough for government work”. It seems that regardless of what tools one uses (I use a Silva Type 60 Compass, a Suunto clinometer (Type PM-5/360 PC), the latest geodetic maps (to correct for magnetic deviation), and an astronomical program on my Mac called Voyager II), each one of the measurements that I took could have been done more accurately with better tools. I’ve even left out certain calculations like how much the Sun’s rays are bent as it comes over the horizon. Etc. etc. Sacred space is created through intent. Elizabeth Sulivan intended to make a place of healing, she dowsed the orientation of her labyrinth. This would be from the goal, through the mouth, to the horizon. I found this to be at a magnetic azimuth of 226 degrees (corrected to 223 degrees True) with an angle of elevation to the horizon of 3 degrees. According to my calculations, at Latitude 51 Degrees 43 Minutes West, Longitude 4 Degrees 53 Minutes West (my thanks to Roy Proctor for these satellite-taken measurements), on the Winter Solstice, December 21st, 1996, with an angle of elevation to the horizon of 3 degrees the sun will set at 3:37 p.m. GMT at an azimuth of 224 Degrees 45 Minutes! A bit over one degree off. My calculations, as accurate as I attempted to be, could easily be that much off. Well within a geomancer’s “orb”. And Elizabeth Sulivan dowsed this Winter Solstice Sunset orientation! There are two stone rings outside the Benton labyrinth (actually, one has part of its circumference within the labyrinth). [See the first photo in this article] Elizabeth also dowsed the necessity of these circles and each stone’s location. One of the other energy leys, one of the earthing point leys, is with in a few degrees of the Beltane sunrise, but it is a bit too far off even with the two-degree orb that I am using. This is a truly amazing labyrinth. It was dowsed for both location and orientation. There were no domes of water there before Elizabeth Sulivan began. Now there are energy leys, a dome, and an orientation of the major axis towards the Winter Solstice sunset! Alexander Thom, aretired professor from Oxford, went out with his theodalite (accurate surveyor’s tool) and measured anumber of stone rings in Britain. He found that while some were true circles, most fell into ahandful of other geometrical shapes (egg-shaped, ellipse, flattened circles). John Barnatt, an archaeologist in the Peak District of England, got his students to take fifteen or twenty thin sticks, and to make a big circleby eye only. They did this a number of times, and each time John used a theodolite to locate each stick. Using that same concept of fudge factor that I was talking about earlier, John Barnatt found that the rings thus created by eye conformed statistically to Thom’s geometrically perfect flattened circles, ellipses, and egg shapes better than the actual British stone rings presently do! Scientists call this orb “statistics”. First, there is the question about the labyrinth’s apparent ability to draw a dome of water to it. In Max. I went with Patrick MacManaway to visit Billy Gawn, who lives in Templepatrick, Northern Ireland. He is intrigued by this possible labyrinth/dome connection and plans to build several labyrinths to check out this suggested ability. I suspect that if you build a labyrinth and just leave it to see if it will draw a dome of water, it probably won’t work. A labyrinth needs to be used. Elizabeth Sulivan dowsed her labyrinth every step of the way. Given John Barnatts experiment with constructing stone rings, is it possible that dowsing, using only the intuition, is also a way to tune in to the same energies that our foremothers and fathers used in the construction of their sacred spaces? 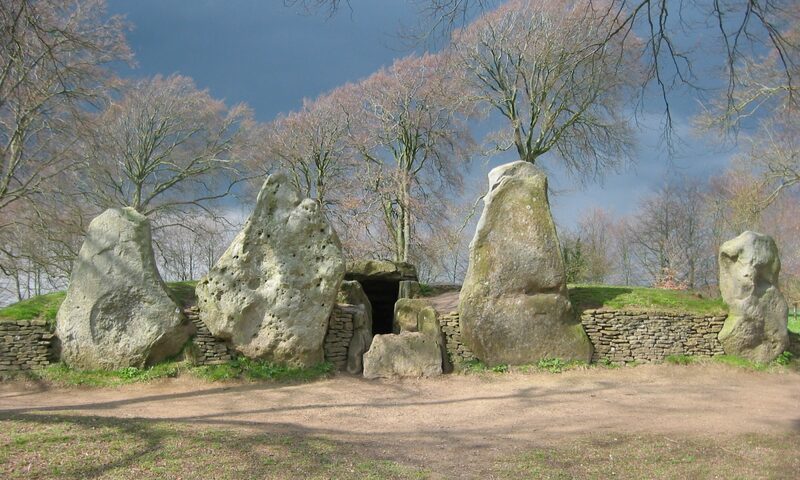 The Benton Castle labyrinth is a truly megalithic monument. Perhaps the most important question is what can this impressive Chartres-type labyrinth be used for? Elizabeth Sulivan says, “This has to be a healing structure and I have to find the key to utilising it’s potential with help from people with ability in this field Labyrinths have also been used as meditative walks, as a tool for looking at one’s life and divining a possible resolution, as a pilgrimage journey (many labyrinths in Gothic Cathedrals were called Jerusalem). but most important of all, labyrinths are tools that connect us with the One. I acknowledge the permission kindly given by Sig to reproduce this article. It was first published on the website of Sig Lonegren and Patrick MacManaway in the 1996 summer solstice edition of Mid-Atlantic Geomancy, MAG E-Zine.